Sydney’s 1994 bushfire did, in fact, kill a young woman. But the death of strangers does not press on people for long. A killer fire will probably hit Sydney in due course, but not yet. The fires cause millions of dollars worth of damage, but if it was not your house that went up in smoke you hardly notice the personal cost of small increases in insurance premiums and the artful ploys of the state government to raise more revenue. For most Sydney people I think there is a sensuous thrill in living under a red-black sky for a week or two, experiencing near-darkness at noon, breathing in lightly smoked air and seeing ashes accumulate in the pool. It’s a toss-up who gets the greater thrill when hostesses call guests to cancel Sunday lunch invitations because “it’s getting a bit hairy out our way”. The telling of post-fire war stories approaches Sydney ceremonial. To stand on the verandah, tracing with extended arm the path of the circle of fire that almost engulfed you, is richly satisfying. If you are lucky enough to live along the myriad inlets and bays of the Hawkesbury estuary, with the Kuringai or Brisbane Waters National Parks at your back, you can keep discussion going into the fourth bottle of chenin blanc about how you sent the women and children to safety in the boat, then joined your neighbours in battling rampaging nature through the night and beyond. The coming of CNN and the internet means that even those of us who cower in the very bosom of civilisation, kilometres from rampaging nature, get a look in as resistance fighters. Overseas friends, seeing Sydney engulfed, call and ask anxiously how you are. As well as can be expected, you gruffly imply. You would be dangerously out of synch with the zeitgeist by following Galbraith and conceding that you were pretty much enjoying it. 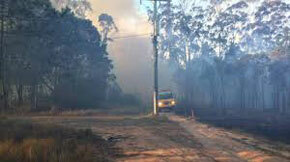 Its bushfires are, in their way, helping to define Sydney. This is a big city that has actual bushfires. Where else sets itself alight at frequent intervals? Los Angeles, of course. But would LA really appreciate its bushfires, as Sydney does, without the additional frisson of movie stars fleeing the flames in their nighties, and celebs watching mega-multimillion dollars of their possessions going up in smoke? Sydney takes its bushfires straight, and giving the finger to nature at its most wrathful is widely seen as enhancing the New World raffishness Sydneysiders like to detect in themselves. Also to be considered is the intrinsic attractiveness of near-wilderness in the city. This is not a subject that comes easily to my consideration. My favourite city parks are Central, Hyde and Meiji, groomed, non-representational renditions of nature under the tight control of civilisation at its most polished in New York, London and Tokyo. I also like patios. The patio is an affront to nature. Freud surely enjoyed them. But I have to concede that, several years ago, I took some enjoyment from a ravine at the end of an urban street where I then lived. It was seven or eight metres deep, pretty narrow and contained a stream, a small waterfall and other chunks of, well, nature, much of it deviantly alien–great thickets of lantana, for instance. My children loved the ravine, and I was not immune to the thrill of slithering down its side into an environment radically different from the mowed-lawn one I had just left. The difficulty of extending this analogy is that access to most of Sydney’s 38,000 hectares of national park is much more difficult than it was to my neighbourhood ravine. The National Parks and Wildlife Service provides in two volumes a detailed guide to 168 bush walks inside the parks of “the Sydney area” but admits that “most walks are intended for walkers of some experience”. Dodderers and blunderers–and the merely short-winded–keep out? Probably so. It is impossible to determine the number of people who make use of New South Wales’s national parks because the NPWS counts as users anybody who drives through those parks that contain major arterial roads. The road through the Royal National Park, most of which is within the Sydney metropolis, is virtually a commuter route from the coast to the city–that is, when the park is not on fire. It was almost totally burnt out in both 1994 and 2002. THE MOTTO of the NPWS twenty or so years ago was “Parks for the people”. Today this would be considered heresy. The present motto is “Our environment, a living thing”. The policy is one of exclusion of people, presumably out of fear that civilians might brutalise this living thing. It is as if the armies of the NPWS have invaded and occupied 5.3 million hectares of New South Wales, driving out hostiles. When nature reserves (“small areas of special scientific interest”) were brought into being in 1999, the NPWS lobbied vehemently, but unsuccessfully, for the removal of the word enjoy from the legislation–this being thought by a majority of the lawmakers to be a good thing for the public to do in respect of nature reserves. I had my own somewhat unnerving experience of the NPWS’s exclusion policy a couple of years ago when, with time to spare, I decided to drive from Melbourne to Sydney over the mountains. Progress along the good roads of Victoria’s Alpine Way was a pleasure. But when we crossed into New South Wales, whose Snowy Mountains are on a grander scale, and more picturesque, paving to drive on soon ended and deep ruts and protruding boulders took over. Worse, we came often to Y-junctions–not recorded on our small-scale map–that bore no signposts. Which way to go was entirely our call. The sense of being unwelcome to the Kosciusko National Park was strong. We might now be skeletons in a mouldering Ford had it not been for my wife’s country girl instinct for compass direction. The NPWS’s sense of ownership has made it negligent–out of reluctance to damage “habitats”–about controlled burning-off of eucalypt undergrowth–the traditional and, in fact, virtually only way of guarding against bushfires running out of control. For all the Service’s protestations and scattering around of irrelevant statistics, this is incontrovertible. It burnt off 19,000 hectares in 2000-01, less than half as much as it did in 1994-95, despite having brought thousands of additional hectares under its control. An anecdote will linger: three years in a row, scheduled burn-offs in the north-western corner of Sydney were called off because they threatened the habitats of purportedly rare frogs and the breeding grounds of relatively commonplace cockatoos. In the event, runaway fire wiped out these areas anyway, damage to human habitation being prevented by prodigious firefighting effort. We of the Premier State need no reminder of this. Carr has established his own Kyoto Protocol and ordered electricity suppliers to cut greenhouse gas emissions by 14 per cent on 2000-01 levels by the middle of this decade. My electricity bills now state the quantity of fossil fuels consumed in order to feed my habits, and invite me to consider installing solar-powered devices. No argument is offered as to why I should care or act. I share George W. Bush’s uncertainty about the causes and effects of slight global warming. Carr seemed uncharacteristically rattled when he returned hurriedly to Sydney from an overseas jaunt and found his state on fire for the second time in less than eight years. He blamed it all on firebugs and said heavier jail sentences were needed for arsonists. Possibly jail alone was too good for them. They should also be made to confront people whose property had been destroyed (and, implicitly, bereaved relatives, if any, of fire victims). In response to this, the Daily Telegraph committed the grave error for a tabloid of excessive ingenuity. It ran a front page of blacked-out heads of twenty-one accused arsonists under the headline “21 LUCIFERS”. Close scrutiny revealed that twelve of these devils were fifteen or younger, the youngest only nine. Many if not most of the arsonists appeared to have started big fires inadvertently with small fires. The father of one took strong offence to Carr’s threat of doom for his son. The Director of Public Prosecutions came out with an unequivocal declaration that existing penalties for arson were adequate. Carr’s fighting words about arsonists suffered quick public identification as a smokescreen, so to speak. Carr’s environment minister Bob Debus fared no better when he asserted that greater use of burn-offs would have made no difference to the state’s bushfire assault. As he spoke, fire brigades were frantically burning off in an effort to halt advancing walls of out-of-control flame. Also lacking sincerity, in my view, was the Carr government’s abrupt decision to place authority for all decisions about hazard reduction (that is, burning off) in the hands of Rural Fire Services Commissioner Phil Koperberg. Effective and noticeable in the field every few years, Koperberg is a public servant who has shown no capacity or desire, between fires, to override Greens, local councils, the NPWS or anybody–certainly not the Premier or any of his closer associates. A more complex man than Koperberg would surely be reflecting on the role of the scapegoat in public life. As a Sydney dweller, I have no confidence in his ability to protect my city from the fires–nor me personally, should I be so reckless as to move to an outer suburb. Who would support Koperberg if he chose controversially to burn off part of the Lane Cove River Park that was home to a distinctive family of bogong moths? Hardly anybody. The meekness of the public in accepting media and official statements about suburbia encroaching on the bush is astonishing. Surely the bush is encroaching on suburbia. Nature is menacingly intruding on civilisation. There’s no sense to the NPWS’s administering its holdings in Sydney the same way it does its Snowy Mountains parks. For tiny instance, it is against the law to play ball games in Kosciusko. I suppose you might fall on a valuable toad in diving for a slips catch. But it is effrontery to run the same regulation across the Sydney area, where a million or so people want to play ball games in their parks. If Carr wishes to pursue his green dream, he would be wise to have the NPWS relinquish its claims on the Sydney area–where there are too many scrutinising eyes for his comfort–and put the national parks (and nature reserves) there in the hands of an entirely separate, relatively Greens-free, metropolitan authority whose brief would be to defend civilisation. Nature would receive a fair go, because it is popular, but not a free ride. If bulldozers were needed for defence against nature’s rapacity–a hundred-metre gap between bush and house is, for example, considered a minimum safety barrier to fire–the bush would have to go, not the house. Previous Post:Tornado Time: What To Do? The wind carries burning debris and embers and this causes fire. Stay safe. Use wet towels and blankets to seal the gaps in your doors.